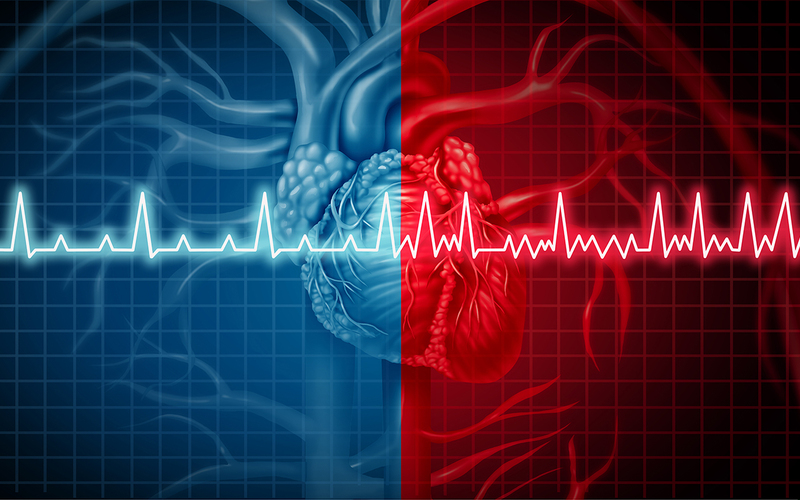 A team of researchers led by the University of California San Diego has identified a genetic pathway that causes some individuals to develop an abnormal heart rhythm, or arrhythmia, after experiencing a heart attack. They have also identified a drug candidate that can block this pathway. This pathway from heart attack to arrhythmia is triggered by genetic mutations located in a region of the genome called the 9p21 locus. These mutations are present in about 23 percent of the population. “Past studies have suggested that mutations in the 9p21 locus could be linked to these cardiovascular diseases, but there was no understanding of why and how. Now we have specific answers to these questions,” said first author Aditya Kumar, a bioengineering PhD student in Engler’s lab. Engler, Kumar and colleagues discovered that when a heart attack hits, the mutations activate a key player in the pathway—a signaling protein called JNK. Normal heart cells can keep JNK in check after a heart attack. But in cells with the mutations, JNK sends signals to downstream targets that ultimately break electrical connections between heart cells and cause them to beat out of sync. Researchers also showed they could reverse and prevent this damage by blocking JNK. They used a molecule called SP600125. It’s a known JNK inhibitor, but according to Engler its derivatives have not been tested clinically for cardiac conditions related to 9p21 as they may have off-target effects. “In the future, we envision that cardiac patients could have their genomes sequenced and if they have the 9p21 mutations, they could be given a drug based on this inhibitor so they are better off in the event of a heart attack and won’t develop arrhythmia,” said Engler. The team made their discovery using stem cells and hydrogels that mimic how the heart stiffens as a result of a heart attack. Engler calls it a “heart attack in a dish.” The hydrogels are made of a biomaterial called methacrylated hyaluronic acid, which can be stiffened to varying degrees by exposure to UV light. Researchers first stiffened the hydrogels enough to mimic the stiffness of healthy heart tissue. They then seeded the gels with heart cells derived from induced pluripotent stem cells. Some gels were seeded with cells obtained from individuals with mutations in the 9p21 locus. Others were seeded with cells from individuals without the mutations. After, the gels were stiffened even more to mimic what happens in a heart attack. Researchers then looked at how the heart cells responded to this stress. Those with the mutations were beating abnormally because their electrical connections were no longer intact. Meanwhile, the cells without the mutations continued to beat normally. “It’s remarkable that stiffening by itself was a sufficient stress to cause the changes that we saw in the cells with mutations,” said Engler. Ongoing studies will examine whether these effects will be seen in actual patient tissue. The team will further explore treatment using JNK inhibitors. Paper title: “Mechanical activation of noncoding-RNA-mediated regulation of disease-associated phenotypes in human cardiomyocytes.” Co-authors include Stephanie K. Thomas, Kirsten C. Wong, Daniel S. Cheah, Yang-Hsun Hou, Jesse K. Placone and Kevin P. Tenerelli, UC San Diego; and Valentina Lo Sardo, William C. Ferguson, Ali Torkamani, Eric J. Topol and Kristin K. Baldwin, The Scripps Research Institute. This work was supported by the National Institutes of Health (grants R01AG045428, UL1TR025774, U01HL107436, U54GM114833, F32HL126406, T32HL105373, and T32AR060712) National Science Foundation (grant 1463689), and the ARCS/Roche Foundation Scholar Award in the Life Science.